The Total Perspective Vortex derives its picture of the whole Universe on the principle of extrapolated matter analyses. Since every piece of matter in the Universe is in some way affected by every other piece of matter in the Universe, it is in theory possible to extrapolate the whole of creation – every sun, every planet, their orbits, their composition and their economic and social history from, say, one small piece of fairy cake. Trin Tragula – for that was his name – was a dreamer, a thinker, a speculative philosopher or, as his wife would have it, an idiot. She would nag him incessantly about the utterly inordinate amount of time he spent staring out into space, or mulling over the mechanics of safety pins, or doing spectrographic analyses of pieces of fairy cake. And so he built the Total Perspective Vortex, just to show her. Into one end he plugged the whole of reality as extrapolated from a piece of fairy cake, and into the other end he plugged his wife: so that when he turned it on she haw in one instant the whole infinity of creation and herself in relation to it. To Trin Tragula’s horror, the shock completely annihilated her brain; but to his satisfaction he realized that he had proved conclusively that if life is going to exist in a Universe of this size, then the one thing it cannot have is a sense of proportion. Many things in the natural world do prove to be humbling and give one great perspective as to your size on this planet. A trip to the grand canyon a few years ago was one such occasion. I often work outdoors through the night but confess to being too busy to take advantage of Bivouacking. However i was working last night with one of your regular contributors, T1Thousand, and have to admit that when he lay down on the ground in the middle of our shift i took this to be at best fatigue from a moments manual labour and at worst downright laziness, i now see it as something much deeper and more profound and for that insight i do thank you!! Quoting literature in a comment, C! You fiend! Also, by bivouacking and comprehending the enormity of the universe, are you and Mr Adams suggesting that I was toying with my brain's annihilation? If that's the case, I should probably suggest that people *don't* bivouac. And Damo - welcome to Lexicolatry! I hope that this is the first of many comments from you. I am a little jealous, however, as I've never seen the Grand Canyon and it's on my long and growing 'to do' list. To have the time to enjoy nature and drift off so peacefully while looking into the never ending universe with the slightest breeze on your face after just eating, yes, a fairy cake! So I guess The Matter is clear! Enjoying Bivouacking is something we all should do and enjoy a bit of creation while doing it. Since you seem to enjoy profoundness and insight so much, I would be honoured to show you the universe from putting you on your back so you could experience the paralysing effect that some creation has to offer. "To have the time" - you hit the nail on the head there, T1. As I was writing this post I was asking myself why I'm not making the time for this, for something I loved so much, for something that's so reflective and connecting. Have I really become so caught up in 'life' that I've forgotten these things? I think I may have - and I think I will need to do something about it. We call it "bivak". It's a thing just about any and every youth organisation (think scouts, but we have A LOT of different kinds of those things) does. Not a lot of the "bivaks" happen under the open nightsky though; kids are spoiled, or maybe it is because it always rains in Belgium... Anyhow, "bivaks" do usually include nightly outdoor games and campfires, so there's still an open-air-nighttime aspect to them. Also, Ed: stars? What are stars? Those three (or four, if you're lucky and the electricity fell out) tiny dots you see at night? @everyone: Do you guys all know eachother? o.O I feel kind of like the odd one out, today. Seeing the stars is the problem, Bibi. That's why I used to go out of the city and sleep in the country. And there ... wow! ... Bibi! Don't tell me you've never seen the stars on a clear night in the country? It's breathtaking - like a million tiny diamonds scattered across a black cloth. The sense of awe and majesty is truly profound. It seems that Damo and T1 certainly know each other from work - though quite what work they doing together is hard to fathom from T1's last comment ... ? Something to do with throwing each other on the ground? I think either judo instructor or bouncer in a night club. Which might explain why Damo is often outdoors during the night. He's the one who decides which people are allowed in. And nope, no stars. Even the countryside is overly lit over here. I've no idea what a proper nightsky looks like. I feel a deep sense of rest and peace when I have the privilege to spend time close with nature. 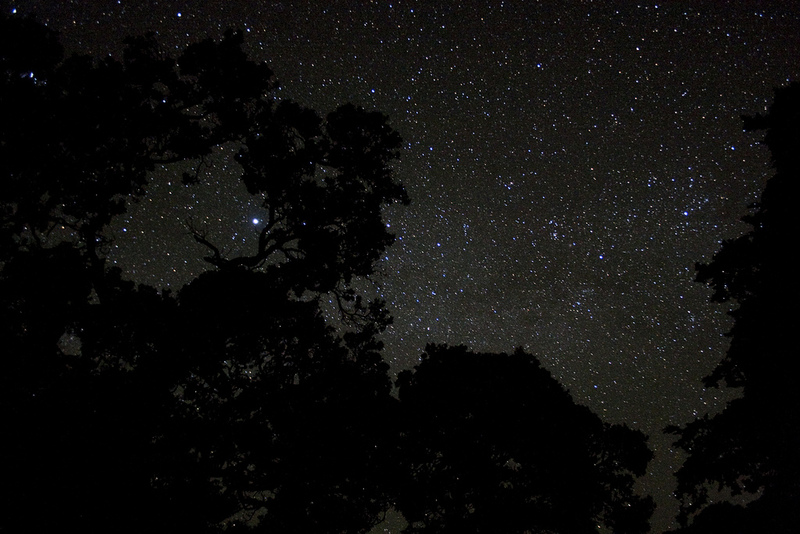 I am so thankful I live in such an open and sparsely populated part of the world - seeing the stars is so much easier. When I was a kid, we would sometimes climb onto the roof of the shed on the school playground in our tiny town (200 people at most)... We would lay on our backs and stare at the stars for what seemed like hours. It serves as an excellent reminder that we are infinitesimal in the scheme of our world and the long history of those before us - those who gazed at the same sky as us. It is strangely humbling, Kara; you feel at once both both minuscule and exhilarated.